Ruan Thai was really not on my radar that day. Initially, I was going to review a Japanese ramen-noodle house a couple of doors away. I decided to meet up with my college-mate who lives around the corner for lunch on Easter Monday when we teachers are granted this rare weekday respite (slave labor here). Upon entering the noodle house, it appeared empty and I asked the young host if I could sit near the window for some good photos. He was very amenable and I plunked myself at my table of choice. While I was testing the camera’s settings with a test shot of the tableware, I heard a knock on the table. There was Mr. Chef staring me down and asking why was I taking a picture. I explained my purpose of visiting his eatery with my equipment, but he denied me permission to use my baby Nikon – two run-ins now with Mr. Chef’s over photos in the course of two days (see last blog – Ristorante Piccolo). I packed my stuff up and quickly bolted out of there – I refuse to write a blog without a single visual representation. No photo, no food, no blog! I walked out feeling incredulous that a restaurant would not want some free publicity. Looking around and waiting for my ambling friend, I noticed Ruan Thai, a place mentioned by another friend about his foray into this Southeast Asian eatery as a Thai virgin (foodwise, that is). When my buddy arrived, I told him of the incident and we made our entrance into our chosen place. Even though I have already reviewed 3 Thai eateries, the demise of my favorite Thai restaurant around the corner has spurred me to find a decent and veritable replacement. 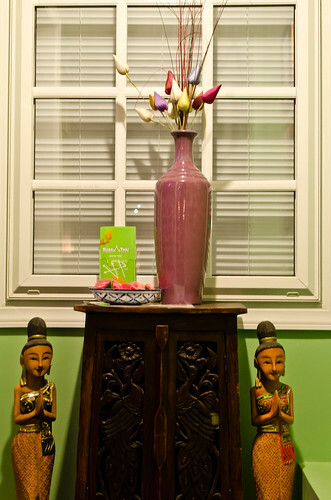 And I am glad that fate has pointed me to Ruan Thai, and I paid it a couple of visits to write this review. To start the meal off, I decided to order a couple of traditional appetizers. 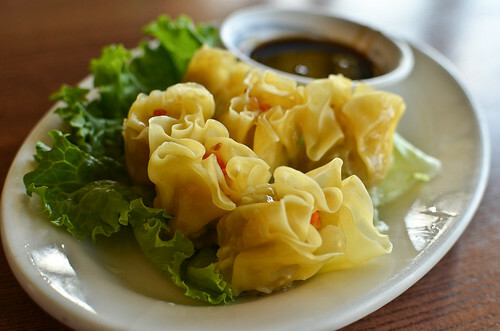 Kanum Jeeb are steamed dumplings with a ground chicken and crabmeat stuffing. The filling was rather bland and the wrapping a bit understeamed. But the thick caramelized soy sauce brought these small bites to life with its sweet and salty flavors – I find that most Thai appetizers are underseasoned in order to allow the accompanying sauces to play a vital role in the dish. The next opener was Peek Kai Yud Sai which are deep-fried chicken wings that are stuffed with a filling of chicken, crabmeat, Chinese black mushroom, and spring onions. 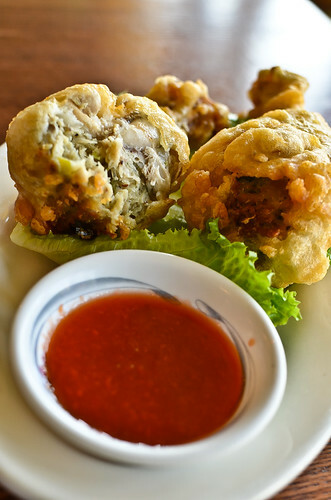 The filling here had more flavor and the tempura-like batter provided the contrasting crunch to the moist stuffing. The sweet and spicy sauce added another interesting note to one of my favorite Thai appetizers, which are not often found in many eateries these days. It did bring up memories of the version served by my favorite eatery before its closing. On another visit, some friends and I decided to try out their soups. 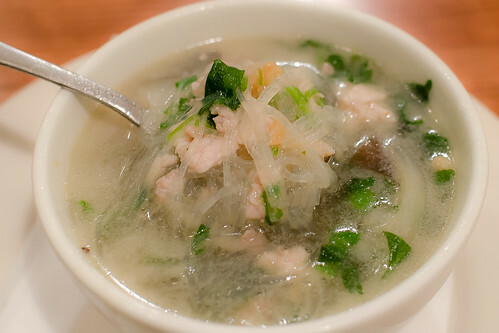 Gang Jued Woon Sen is a clear chicken broth filled with minced pork or chicken, slippery beanthread noodles, crunchy wood fungus, and fragrant spring onions. I had a taste from my friend’s bowl and I really enjoyed a couple of spoonfuls. What elevates this soup is the use of the dried salted vegetable that adds a salty and slightly crunchy element to this simple soup. For my order, I had a classic – Tom Kha. 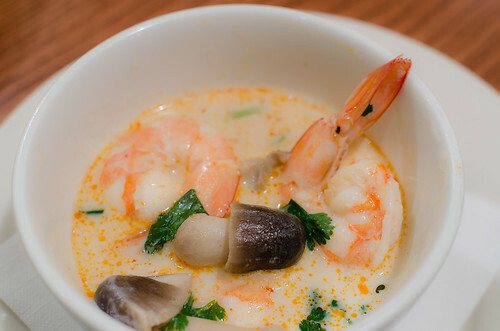 It is a rich coconut milk soup spiked with chili paste, lemongrass, galangal root, kaffir lime leaf, cooked with shrimp and straw mushrooms, and lifted by a sour hit of fresh lime juice. This is a true study of contrast with the rich coconut against the sour citrus, the strong flavored spices and aromatics against the mild shrimp and mushrooms. Love the soup offerings here. One of the strong suits in a Thai restaurant is the curry that it serves, and I decided to try out the Green Curry. 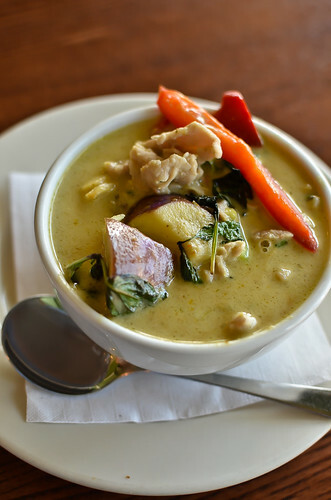 My dish came with slivers of pork, crunchy bamboo shoots, not-to-soft asian eggplant, fragrant basil leaves, crunchy sweet peppers, all in a spicy, slightly sweet and coconut-rich green curry that exuded a complex flavor profile. The dish would have been perfect if the pork had not been overcooked, thus its slight toughness – Asian restaurants tend to do this with this meat, perhaps a common practice on the other side of the globe. However, I enjoyed its rich tastiness with the fluffy jasmine rice which made the perfect foil. 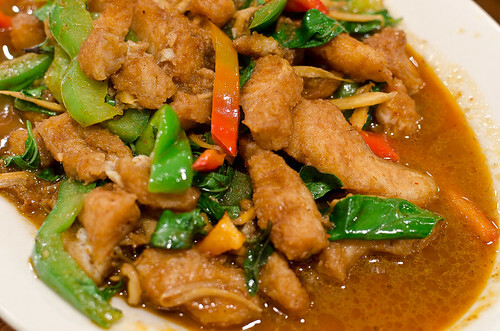 My eating companion’s entrée was Pla Pad Ped, which is fried catfish bites in a spicy red chilli sauce along with sweet peppers, basil leaves, and julienned rhizome. The fish pieces were slightly crispy, the sauce real ped (fiery), while the basil leaves provided the fragrant relief from the heat, and the julienned rhizome an interesting je-ne-sais-quoi note to the sauce, akin to mild ginger. Even though my friend was comparing it to the version from our defunct favorite joint, he seemed pretty pleased with this rendition, and the searing heat was totally up his alley, which is a far cry from his earlier virgin days when he was intolerant of such spiciness. On my second visit, I ordered Gai Yang Som Tum as my main course. It is a grilled young chicken that has been marinated in coconut milk and fragrant spices like coriander root (stronger than the leaves themselves) and pungent black pepper. This is a Northeast Thailand dish that is not commonly served in the restaurants, and I’m glad that this eatery had offers it as one of its specials. The chicken was moist and fragrant from the marinade, covered by the skin made crispy from the grilling. Accompanying the chicken were the customary sides of steamed sticky rice that came in traditional rice basket (keep it in the container or not it will dry out quickly), and a Green Papaya Salad. The salad was a hit with its slighty crunchiness, the sweet and sour lime juice dressing, the briny dried shrimps, and the nutty crushed peanuts – a perfectly balanced salad that complemented and rounded-off the chicken dish. A great offering, indeed. 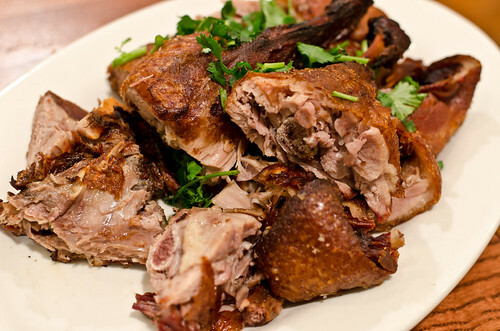 Another friend’s order one night was Ped Tod Kob, a half duck that has been marinated in aromatics and fried crispy. It was fragrant from the use of the complex 5-spice powder, flesh still quite moist, and the skin properly rendered from its fat and made crispy from the frying. The sweet 5-spice infused sauce added the necessary moisture and flavor to the duck meat. Even a mate who finds duck quite unappealing said that the skin was nearly devoid of the fat and he found it quite palatable. 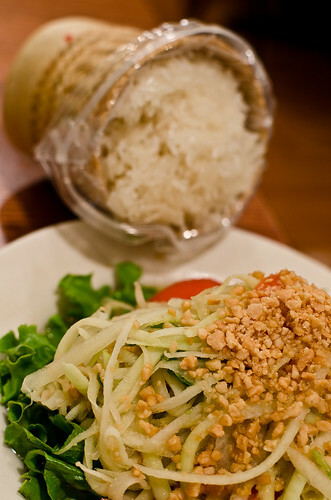 Ruan Thai offers many classic dishes that are commonly found in most restaurants. 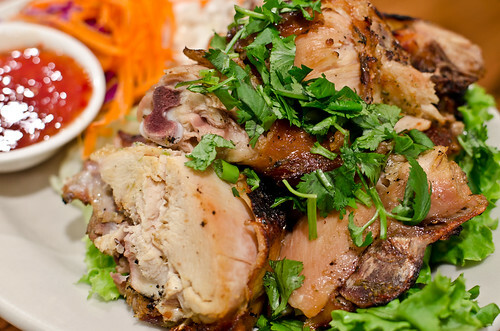 What sets it apart from the others are the not-so-common offerings like the stuffed chicken wings and the Isaan grilled marinated chicken. Whether the dish is easily recognizable or a new discovery for the eater, the kitchen does a good job providing authentic flavors and it delivers in its tasty offerings. So far, it is nearly tops in my search for a replacement for my favorite Thai restaurant. I see myself making future visits to sample more of this kitchen’s wonderful cooking.